Many wish to know the annual rainfall, snowfall and elevation information for various El Dorado County towns, which I will try to cover on this page. 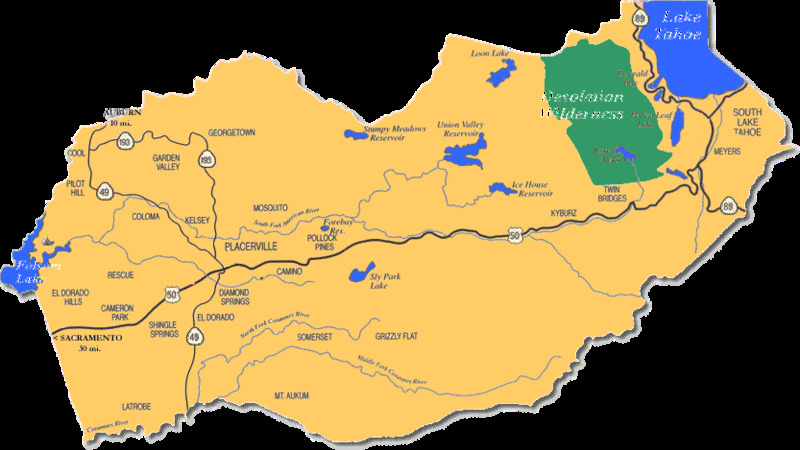 Our main El Dorado County towns are El Dorado Hills, Cameron Park, Coloma, Shingle Springs, French Town, Cedar Grove, Camino, Diamond Springs, Pollock Pines, Georgetown, Lake Tahoe, and of course Placerville. Also, please see several more links below for more targeted data. For this years Placerville rainfall total to date along with more Placerville weather data click here. Elevation depends upon how far out you live from the closest El Dorado County town, because of the very hilly and mountainous terrain typically surrounding many of our county's towns. I like to carry my trusty altimeter to nail down the correct elevation of Anywhere, El Dorado County. The following elevations were taken from the main town center of the below listed towns. upon where you live in the surrounding area. Snowfall amounts can vary tremendously depending on elevation. Placerville on down in elevation to El Dorado Hills usually receives very little snowfall during the winter. 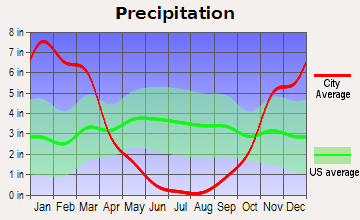 Placerville will normally receive 3 to 6 inches on a few occasions during the winter which normally melts very rapidly. On rare occasions Placerville can receive considerably more. In the winter of 1990 for example, Placerville saw nearly two feet of snow on the ground, with Cameron Park and Shingle Springs receiving upwards of one foot of snow. This paralyzed the local towns and surrounding areas for many days, and a few weeks in some cases. Several local areas had no electricity for as long as about two weeks. Our local power company (PG&E) had an enormous job of restoring electricity to thousands of customers from downed power lines, trees, and fried or zapped electrical transformers because of all the snow. Even the town of El Dorado Hills at 765 feet had several inches of snow on the ground at that time, with snow falling all the way down the the Sacramento Valley floor, which is near sea level. Every so often, and very rare, even the Sacramento Valley floor has received a few inches of snow that stuck to the ground. It has indeed happened a few times in the 35 years I have been monitoring the weather here in Northern California. Camino at 3,000 feet can receive quite a bit of snowfall during a normal winter, and is typically very near the winter snow line. Having a foot or two on the ground after a good strong and cold winters storm is a fairly normal occurrence. It will usually melt fairly rapidly. The typical snow level during the winter is near Pollock Pines at about 4,000 feet, which is about 1,000 feet higher in elevation that Camino. Shingle Springs and Cameron Park, although lower in elevation than Placerville, can also receive a dusting of an inch or two of snow a few times a year, a little lower in elevation the town of El Dorado Hills rarely gets any snow at all to stick to the ground. The local Sierra Nevada Mountains above 6,000 to 7,000 feet, up to around 10,000 feet and higher, are considered as one of the snowiest areas in the entire continental United States. Tremendous amounts of snow will fall during a normal snow year, and almost unheard of amounts can fall in the more wet/snowy years, with amounts greater than 40 feet deep occur. The Northern Sierra Nevada mountains has historically received snow during every month of the year. I have personally seen snow fall in every month of the year including July and August. Although rare, it does and can happen. A typical year will see a good 20 feet of snow on the ground in the higher mountain meadows near the end of the season. In the thirty five plus years that I have been monitoring Northern Sierra Nevada Mountain weather, in and around the Lake Tahoe area, to the Southern Sacramento Valley, I have seen many unusual weather events. For instance one year quite a while ago, I saw in excess of twenty feet of snow fall in the first two weeks of April. Or during one snowfall event when I went inside a gambling casino in South Lake Tahoe, during which time there was absolutely no snow on the ground at all. Several hours later when I went outside to drive back to our family vacation house, there was 2 to 3 feet of snow on the ground. I wasn't sure if I would be able to make it back to the house which was about a 15 mile drive, but somehow we did make it home. The snow was as high as the hood of our car and was flying off into the windshield making it even more difficult to see than it already was. Thankfully the snow was a very dry snow, this made it much easier to drive through such deep, freshly fallen snow. As mentioned earlier, Lake Tahoe is at an elevation of 6,260 feet, and is on the east side of the Sierra Nevada Range. Because it is on the east side, it only gets about 32 inches of precipitation a year (counting rain and snow), which is significantly less precipitation than the 80 plus inches a year that the upper west slope of the Sierra Nevada receives. In fact, Placerville California receives more precipitation per year than the Lake Tahoe area at about the 6,200 foot elevation (See rainfall charts below). This is due to the blocking effect (rain shadow) of the Sierra Nevada range. However, Lake Tahoe still receives a very significantly amount of snow during the winter, and the west slope of the Sierra Nevada receives and amazing amount of snow during a normal year. 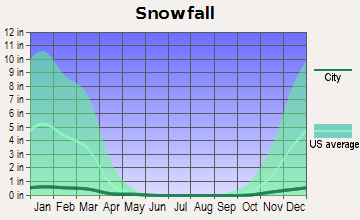 I have seen in excess of 60 feet of snow on the ground during an extremely snowy year in the upper elevations. Tule fog can sock in the central valley for days and even weeks at a time. I recall many years when you didn't see the sun for over a month straight from the tule fog in the lower Sacramento Valley. Normally the tule fog stays below 1,000 feet but it is not all that uncommon to see fog in Auburn, Cameron Park or Shingle Springs in and around the 1,000 foot level. It usually burns off however, unlike the valley. If fog has been in the valley for several days in a row it tends to get thicker and thicker and on a few occasions in a typical year Placerville (above 1,500 ft) will see very short lived fog, usually in the evening hours or at night. This only occurs just a few times a year. Very rarely will Placerville see any daytime fog. So for Placerville fog is a non issue. It is absolutely wonderful to be basking in the warm sun in Placerville while the valley is completely socked in with bone chilling fog. I do remember one freak occasion several years ago when the thickness of the fog was over 3,000 feet thick. The fog went all the way up to Camino at 3,000 feet, which is incredibly rare. Lake Tahoe is the second deepest lake in the United States and the tenth deepest in the world. It is a very popular resort area all year long. With snow sports in the winter, and summer sports like golf and hiking. 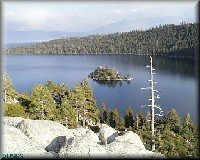 The highest alpine peaks in the general Lake Tahoe area are Freel Peak at 10,891 feet (3,320 m), Monument Peak at 10,067 feet (3,068 m), Pyramid Peak at 9,983 feet (3,043 m) (in the Desolation Wilderness), and Mt. Tallac at 9,735 ft (2,967 m). Much of this area is pure wilderness! Chalk full of bear, mountain lions (Cougar), Deer, and many other wild animals and bird of prey. The Lake Tahoe area offers some of the best skiing resorts in the world with countless sky resorts dotting the mountains in and around the Lake Tahoe area. Many Lake Tahoe area ski resorts are world recognizable. Lake Tahoe Area Ski Resorts are - Heavenly Valley, Squaw Valley USA, Kirkwood, Mt. Rose - Ski Tahoe, Northstar-at-Tahoe, Sugar Bowl, Soda Springs, Tahoe Donner, Diamond Peak, Homewood and Sierra at Tahoe. The Winter Olympics was held in Squaw Valley in 1960. 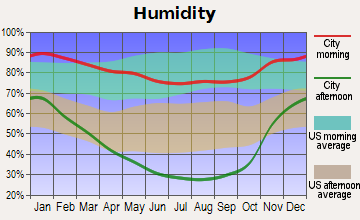 Generally El Dorado Hills receives an average of near 25 inches of rain a year, Cameron Park receives about 30 inches of rain per year, with Shingle Springs getting around 35 inches of rain a year. Placerville averages 38.75 inches of rain a year and Camino receives in excess of 45 inches of rain a year. The higher up in elevation, the higher the rainfall averages are. There are as in many areas of the world the favored rainfall areas that receive more annual rainfall that other areas of the same elevation. You can typically see in excess of 80 to 100 inches of rain a year on the upper west slope of the Sierra Nevada Mountains. Frequently the Sierra Nevada Mountains have 100 mile per hour plus winds in the more exposed areas during a strong winter storm, which is well above hurricane force as these strong moisture laden storms plummet the mountains straight off the Pacific ocean. 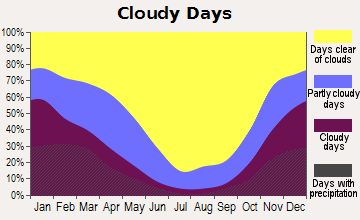 For more climate and weather data information see the About The Site page. 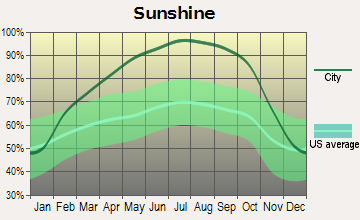 There are numerous climate zones in El Dorado County with greatly diverse weather conditions depending on elevation. Elevation in El Dorado County starts with gentle rolling hills at about 700 feet on the western border of El Dorado County near the town of El Dorado Hills, and goes all the way up to steep and rugged mountainous alpine terrain with the highest peak being 10,891 feet at Freel Peak in the Sierra Nevada Mountains. The lower elevations enjoy mild winters and warm summers. Cold and snowy winters are the norm for the South Lake Tahoe area. The higher up you go the larger the annual rainfall/snowfall amounts are. At the county's lowest elevation at around 700 feet the average rainfall is about 25 inches a year. Go up to 1,800 in the town of Placerville (the county seat), and you will find an average annual rainfall amount of about 39 inches per year. This is about 14 more inches per year with merely a 1,100 foot elevation difference. The higher elevations on the western slope of the Sierra Nevada Mountains receive an enormous amount of rain and snow. The climate change and the rainfall amounts as you proceed up in elevation are truly remarkable. Each elevation step of 500 feet will see a very large difference in climate and rainfall amounts. Of course this is very typical with higher rainfall as you continue up in elevation due a weather term called uplifting caused by the mountains below. Mountainous terrain will cause clouds (moisture) to rise in elevation. The weather term for this is called "uplifting". The uplifting of clouds or moisture causes more rainfall because moisture condenses as air rises. The western slope of the Sierra Nevada Mountains squeeze tremendous amounts of precipitation out before the rain/snow producing clouds continue on to the east side of the mountains, where annual rainfall amounts diminish rapidly into desert conditions. El Dorado County is perhaps most famous for being ground zero for the gold rush in 1849 and for its resort towns at Lake Tahoe, one of the jewel of the Sierra Nevada Mountains. 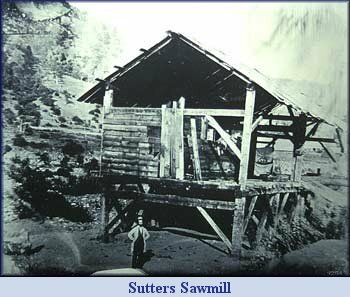 Gold was discovered in the town of Coloma at Sutters Sawmill on the American River, about 11 miles from Placerville. Here is a brief general tour of the lay of the land in this gorgeous and diverse county. The natural vegetation in El Dorado County is as diverse as its numerous climate zones. Its lower elevations from 700 to 1,500 feet consist of rolling hill after rolling hill with various species of Oaks and grass lands. Primarily the lower elevations are covered with Blue Oak, named for its bluish-green foliage, Valley Oak, Live Oak, with Digger Pines sprinkled in round about. Moving up a little higher in elevation, and starting at about the 1,500 foot level you add in Black Oak and Pine trees to the mix, along with more digger pines scattered round about, with the lower vegetation becoming a bit denser. Pine trees are scattered at this elevation. Still higher up and starting at the 2,500 foot elevation to about 3,000 feet, denser Pine tree forestation becomes much more common. Scattered in with Oaks and Cedar trees. From here the higher you get the more the annual rainfall amounts where the lower vegetation becomes more dense. Up to 4,000 feet, the forest becomes much denser still, with more Cedar trees and Fir trees added to the mix with scattered Black Oaks. At 4,000 feet you will now find the occasional Ponderosa Pine known for its height, and unusual bark pattern. These are mixed in where the main species of trees are the pine, cedar, and fir with some black oak, and the occasional mountain maple. The elevation between 3,000 to 5,000 feet finds extremely thick and lush forests, with lush undergrowth, including beautiful ferns, and Dogwood trees. Above 5,000 feet the forest becomes more and more alpine in nature the higher up you get. Still very thick forest at the lower range of the elevation, becoming a bit more sparse the higher up you get due to the extreme weather conditions at the higher elevations. 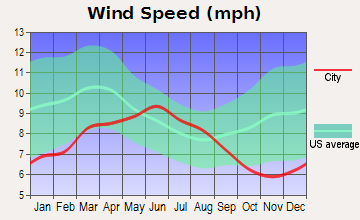 Hurricane force winds of 100 miles per hour plus are common in winter at the highest elevations where vegetation becomes more sparse as you move towards the tree line. If you have never visited El Dorado County, hopefully some day soon you will be able to visit us and take in all of the natural beauty this diverse county has to offer. January 57°F 33°F 7.47 in. February 60°F 35°F 6.62 in. March 63°F 38°F 6.03 in. April 68°F 41°F 2.84 in. May 76°F 46°F 1.56 in. June 86°F 52°F 0.45 in. July 93°F 57°F 0.18 in. August 93°F 57°F 0.15 in. September 87°F 53°F 0.94 in. October 77°F 45°F 2.12 in. November 63°F 37°F 4.91 in. December 57°F 32°F 5.48 in. Averages 73°F 44°F 38.75 in. January 37°F 16°F 6.02 in. February 39°F 18°F 5.40 in. March 44°F 21°F 4.08 in. April 50°F 26°F 2.13 in. May 60°F 32°F 1.20 in. June 69°F 38°F .68 in. July 79°F 43°F .25 in. August 79°F 42°F .32 in. September 80°F 37°F .61 in. October 58°F 31°F 1.81 in. November 47°F 24°F 3.69 in. December 40°F 19°F 5.69 in. 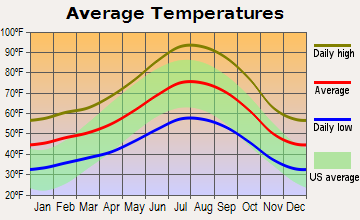 Averages 57°F 29°F 31.88 in. 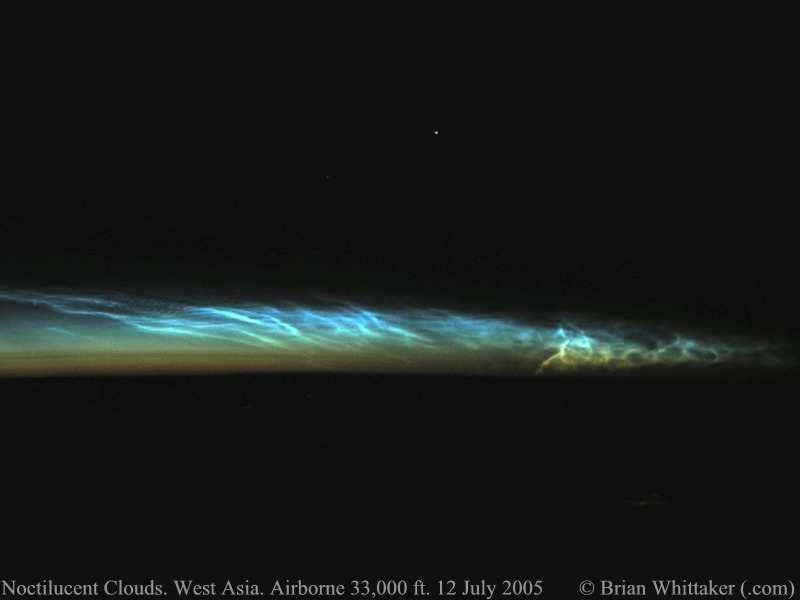 Noctilucent Clouds or Mesosphere Clouds & are very rarely seen! 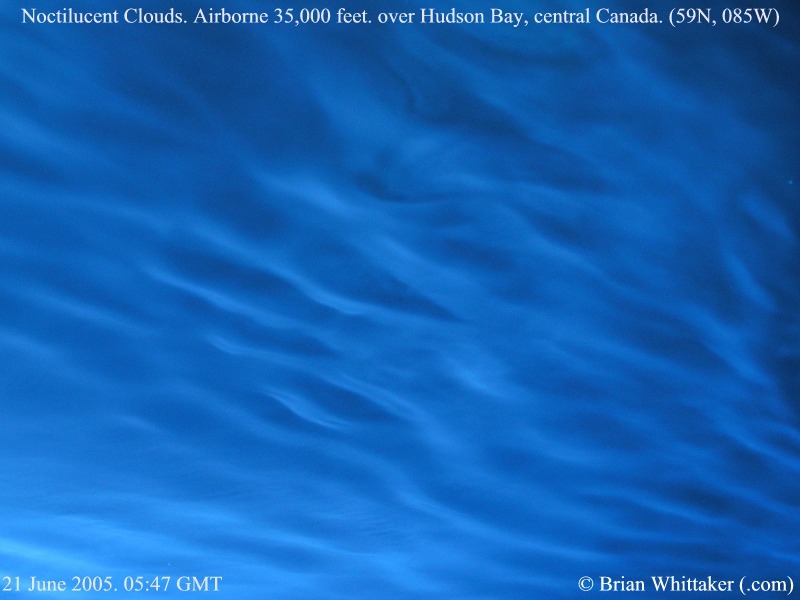 Noctilucent, or "night-shining", clouds appear as thin bands in twilight skies. Noctilucent clouds also known as polar mesosphere clouds are rarely seen. 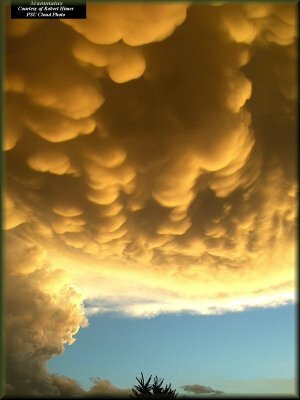 It is thought that these clouds are made of frozen water or ice crystals. They are found very high in the Earth's atmosphere and are formed at the very edge of space in the atmospheric layer called the mesosphere, about 50 miles above the surface of the Earth. They are normally seen from locations near the poles of the Earth, but they have more recently been seen as far south as Colorado and Virginia, which leads scientists to believe that this may be a sign of global warming. They are only seen high in the sky just after the Sun dips below the horizon. Scientists say their observations show how the clouds alter rapidly, hour by hour and day by day. "These clouds are getting brighter with time, they're seen more often and also they're being seen at lower latitudes," said James Russell from Hampton University, Virginia, US. "These are things we don't understand and they all suggest a possible connection to global change; and we need to understand that connection and what it means for the whole atmosphere," he told BBC News. Dr Russell is the principal investigator on the Aeronomy of Ice in the Mesosphere (AIM) mission, a 195kg (430lb) satellite that was launched in April of this year. Sitting 600km above the Earth, the spacecraft has the perfect vantage point from which to study the clouds that are also sometimes referred to as Polar Mesospheric Clouds. They form at high latitudes during summer months in an extremely cold (-160C), dry (100,000 times drier than the Sahara Desert), and low-pressure (100,000 times less than at the Earth's surface) environment. "We'd never seen a picture of the whole polar region before, to see these clouds on a daily basis. That in itself is a revelation - it shows how variable they are from day to day, from orbit to orbit," he added. In the past, they were mainly seen in the summer months, near the poles of the Earth. Sometimes they glow an electric, blue-white color which make them seem very mysterious. Most people who know clouds think the highest clouds are the traditional cirrus clouds or mare's tail, but they are mistaken. 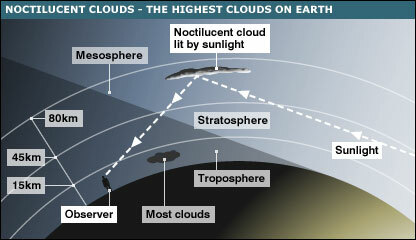 If someone asks if you know what the highest clouds are, you will be correct in saying "Noctiluent" or "Mesosphere" clouds that reside over 50 miles high in the Mesosphere atmosphere. The changes in frequency and brightness have been observed over the past 30 years of satellite observations. They are normally apparent in summer months at high latitudes - at about 50-65 degrees north and south. They have been seen recently as low as 40 degrees North and have become a popular target for amatuer photographers. One study implicated water in space shuttle exhaust plumes as a contributor - and AIM will be following up this theory. 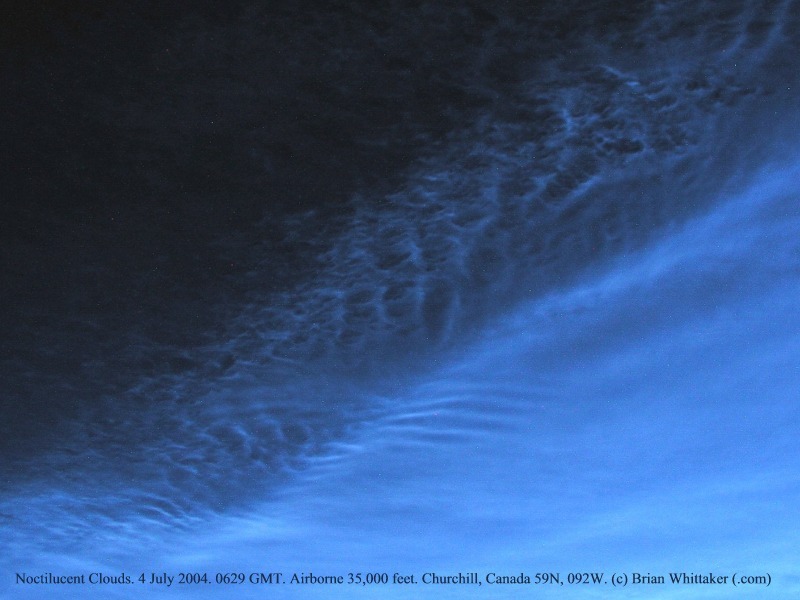 Noctilucent clouds need cold temperatures, the presence of water vapour, and small dust particles around which the water can condense and freeze out to create ice crystals. Something must be changing in this "recipe" to alter the clouds' behaviour in recent years. The AIM team is confident its spacecraft will take it closer to understanding the key factors in play.